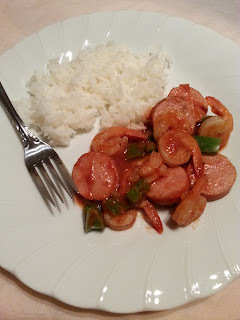 This quick shrimp dinner is a weeknight winner for busy families. In skillet melt butter over medium heat. Add shrimp, sprinkle with salt and cook until opaque, about 3 to 4 minutes. Transfer shrimp to a plate. Add onions, bell peppers, salt, pepper and crushed red peppers, cook until tender, about 5 minutes. Add smoked sausage. Add chicken broth, tomato paste, garlic and cajun seasoning, stirring. Fold in shrimp, cook about 2 minutes, until heated through.